Just add sufficient hot water and salt to the rice flour. Mix the flour well with fingers. 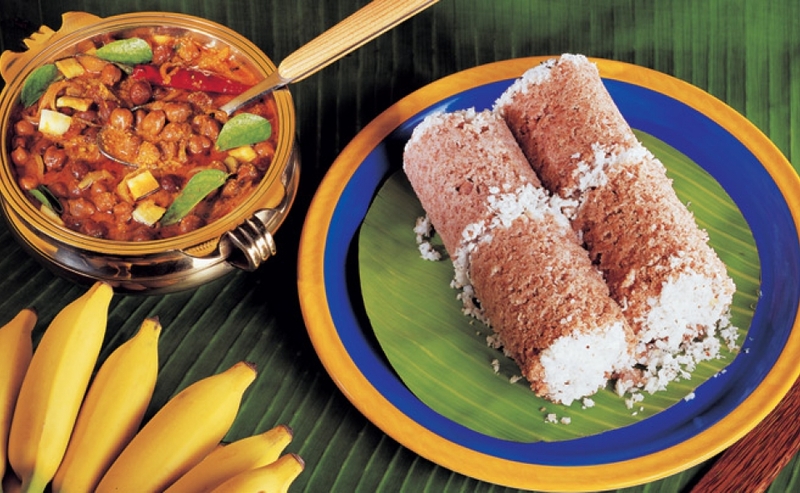 For making the Puttu, you may use the traditional Puttu Kudam. You may begin by adding a spoonful of grated coconut into the cylindrical container, followed by the well mixed rice flour. As you add the rice flour into the container, in between, you may also add small quantities of grated coconut. Make sure that the cylinder is just fully filled and now you may place it on the Puttu Kudam after covering the top portion of the cylinder. Allow the steam to take care of the cooking. Your Puttu will be ready in three minutes. Have it with Kadala curry for a great combination. First, soak the black channa (black chickpea / bengal gram) for at least ten hours by adding salt. Cook the black channa well and keep it aside. Heat one teaspoon of oil in a pan. Put the grated coconut and fry until it turns brown. To this, add coriander powder, chilli powder and garam masala. Stir all the ingredients until it becomes brown. Make a paste of this and keep it aside. Take a pan and heat some coconut oil. Put some mustard and add red chillies. When it begins to splutter, add the diced coconut. Stir a bit. Now add the ginger-garlic paste, followed by onions and tomatoes. Add some curry leaves and stir gently. You may now add the black channa (black chickpea). Pour sufficient water and add salt. Stir well. Now add the coconut paste kept aside to the cooked black channa. Boil the curry well. You may now garnish the curry with chopped coriander leaves and serve it ideally with Puttu. It is a great combination to relish.